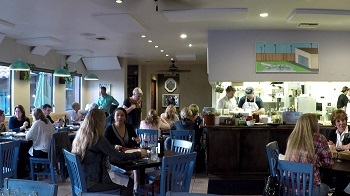 When Brooke and Chef Jacob Town opened The Spoon Trade in 2015, their New American Eatery restaurant just a block from the ocean in Grover Beach, it culminated nearly 20 years of continually honing their culinary and hospitality talents. But the spark first ignited many years ago in a most unexpected place: a badly lit dressing room while Brooke endured the annual agony of school clothes shopping with her mother. “Here, I found this,” says her Mom outside the door. She stands in front of the trio of mirrors wrapping around the five-foot-square dressing room as the dwindling hangers of Possible move to the ever-growing hook of Nope. She cracks the door open and pokes her head out. Her Mom holds up a dress that drapes shapelessly from the hanger. “Just try it on,” her Mom says. She knows one thing: the torture of trying on clothes for the new school year won’t end until the dress is tried on and Mom is appeased. One way or another. So she grabs the hanger of the certain-to-be-a-failure dress and pulls it on. She zips the back and looks up, ready to tell her Mom she hates it. But she doesn’t. Even in the harsh light and reflected in the mirrors that add 10 pounds, she loves it. The shapeless yard of fabric has transformed into the best fitting, most flattering, soon to be best-loved dress in her closet. “Just try it on,” her Mom said. And she was right. When Brooke was growing up in Durango, Colorado, this shopping experience opened her eyes. She began to wonder: What else can happen when we Just Try it On—and say yes to the unexpected, keep our mind open, and welcome new experiences? The Spoon Trade is one shining example. Brooke and Jacob Town outside of Grover Beach Sourdough, their retail bakery that also supplies bread for The Spoon Trade. At the artfully created space just half a mile from the ocean, Brooke and Chef Town share their passion for feeding the people of the Central Coast in ways that meld exceptional food and service in sometimes unexpected ways. Here are just a few ways The Spoon Trade dishes up the goodness. After spending several years working in San Francisco and other cities, they had moved back to the Central Coast. 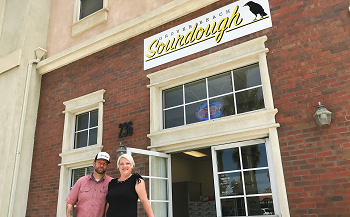 As they settled into life in Grover Beach, where friends and family also live, they walked by the closed restaurant space for a year as they continued to formulate their dream of opening their own restaurant. They loved the location, the proximity to the ocean, and they could see its potential. They also knew that Grover Beach was an unexpected place for the quality restaurant they envisioned because it wasn’t considered the typical location. So they kept walking by the space as they explored other options. “One afternoon, I got a call from Brian Collins,” shared Chef Town. Collins, who is Chef and owner of Ember in Arroyo Grande, and Town had both graduated from the California Culinary Academy. Chef Collins and his wife and Brooke and Chef Town had become good friends when they all worked at different restaurants in San Francisco. And way before that, they’d been friends since high school. Chef Collins knew that Brooke and Chef Town were looking for space and had stopped by the vacant building one more time. “Brian introduced us, we set up a meeting, and the ball starting rolling,” said Brooke. Spoon – good food. Trade – good stories and sharing time with the community. For the great story of how The Spoon Trade was named, check out their website. They’d soon find out that their biggest challenge—and biggest benefit—would be creating their restaurant in Grover Beach. 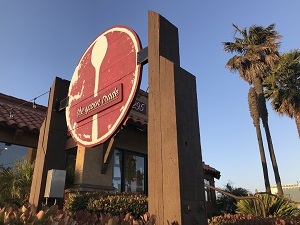 “It’s an up and coming place full of potential, yet some people have a preconception that there can’t possibly be a restaurant like The Spoon Trade in Grover Beach,” said Brooke. 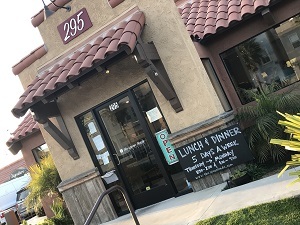 As they worked on renovating the space and opening the doors about six months later, Brooke and Chef Town were ready to change the perception of Grover Beach into a dining destination. The Spoon Trade’s delicious take on the (TST) Meatloaf. The Spoon Trade embraces the American Diner philosophy—approachable, wholesome, nourishing food—but the renditions created by Chef Town are anything but old-school. “We love Grover Beach and use our location to shape, inform, and inspire what we create in the kitchen,” he said. 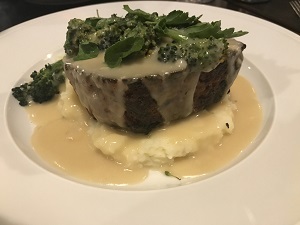 The thick, meaty slab of meatloaf sits with butter crushed potatoes, baby broccoli, and garlic-dijon gravy. Not quite the meatloaf drowning in brown gravy you might expect. Their fried chicken and sourdough waffle (the batter comes from their adjacent Grover Beach Sourdough retail bakery) gets an unexpected twist from rosemary, spiced honey, and kimchi. And their bologna sandwich is no plastic-encircled round of mystery meat on squishy white bread. At The Spoon Trade, they start with their house-made bologna, fried to heighten the flavor, add house-made American cheese, dijonaise, and pickles, and present it on their signature Grover Beach Sourdough bun, emblazoned with a brand. 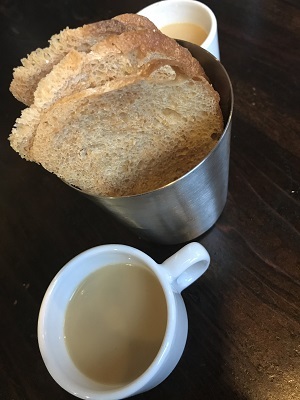 Fresh sourdough and a taste of the Soup of the Moment. Not to be missed is The Spoon Trade’s daily happy snack hour from 4:00 to 4:59 pm. Mini options from the menu and drink specials make for a very happy 59 minutes. And like their motto—We Reserve the Right to Change Things Up and Have Fun Doing It!—the team doesn’t rest on the tried and true. “We’re always trying something new, changing the menu to reflect the seasons and what’s fresh, and also exploring new interpretations,” said Chef Town. To achieve this quality, they thoughtfully and seasonally source the best food (and drink) from the best sources, including many local farmers, fishermen, ranchers, wineries, breweries, and distilleries. And they opened their own bakery to provide the best quality bread at the restaurant. As a whole, Chef Town enjoys showcasing what is in season and exploring different interpretations to share new flavors and combinations. In addition, Chef Town and the entire staff is well-versed in food intolerances and they happily adjust to work with customers who need to avoid certain ingredients. A peek into The Spoon Trade during dinner service. The feeling at The Spoon Trade—welcoming, casual yet graceful, with an unmistakable attention to detail and service—reflects the couple’s shared passion for providing an exceptional dining experience honed over more than 20 years. Their shared passion for this industry started when they worked at different area restaurants on the Central Coast. But when they met at the Cracked Crab in 1999, one of Pismo Beach’s iconic restaurants, their path became clear. Brooke eventually became the manager at Cracked Crab and Chef Town was the kitchen manager. From there, they made their way to San Francisco, where Brooke completed her Art degree and Chef Town received his degree from California Culinary Academy. As they both gained more experience in several top San Francisco restaurants, they started to formulate the idea to open their own restaurant on the Central Coast. 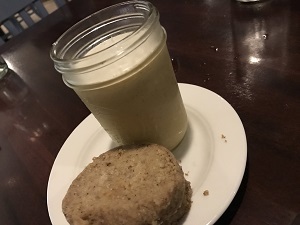 Brown Sugar Pot de Crème with crème fraîche and butter cookie. That might be a celebration dinner for a birthday, graduation, or anniversary, or a quiet drink at the bar after work. Lunch with friends or a bite on the way home from the beach. Sunday brunch or dinner. Whatever the occasion, they want the experience to be about quality, attention to details, and enjoyable from beginning to end. They also pay attention to who comes in, and they really want to be the place of choice for locals. As a testament to their commitment to quality, many chefs, winemakers, restaurant owners, and others in the hospitality industry are regular customers. “We’re honored by the trust they have in us to do a good job,” said Brooke. 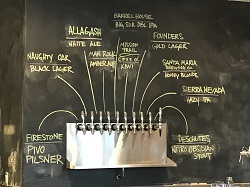 Rotating taps of local (and beyond) wine and beer. In addition, they consciously created an atmosphere that welcomes everyone. From the communal table where anyone can sit and meet new people to the quiet heated patio seating, they want singles, couples, families, and groups to find their place. The menu also reflects this inviting approach. “Customers have told us they love The Spoon Trade because people with very different tastes can happily eat and drink at the same place,” said Brooke. A great burger and a beer for one person and pan-seared halibut and local Chardonnay for the other. Win win win. While The Spoon Trade, like any great restaurant, gets busy during prime evening hours, the wait’s never too long. Or stop by for lunch weekdays and Sunday afternoons or for dinner on Monday evenings when the place is a little quieter. Vermouth mixed drinks add a twist to the traditional cocktail. The drink menu at The Spoon Trade covers a good selection of wine and beer, plus a hard cider, with many local choices. And while they don’t have a full liquor license, that doesn’t mean you can’t get an amazing mixed drink. Brooke is a master with artisanal sherry and vermouth (which starts as wine, is fortified, then flavored with botanicals—flowers, herbs, spices, etc.). If you think you don’t care for vermouth and sherry, take off the blinders and try her renditions of traditional cocktails. You may well find a new favorite. From a range of the best global and local spirits, Brooke creates unexpectedly good drinks. Smoke & Fire is her spin on the Bloody Mary. A Spanish Old Fashioned, with Amontillado sherry, makes for a spicy, nutty, deeply flavorful cocktail. Her trademark Dizzy Bee combines Vya extra dry vermouth, lavender honey, and lemon, reminiscent of a lemon drop martini. 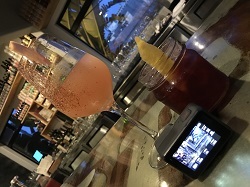 And she creates seasonal drinks, like the refreshing Grapefruit Frost, with grapefruit vermouth, grapefruit shrub, and dry sherry. In another welcoming and unexpected touch, Monday is industry night at The Spoon Trade. Not only do industry people enjoy free corkage, but everyone does. Trying new dishes and familiar favorites with a modern twist. Grilled Spanish Octopus is a great way to start. “Just try it on,” Brooke’s wise Mom suggested many years ago. It’s a great philosophy… not just for dining, but for life. “We love learning and sharing new things,” said Chef Town, and he and Brooke enjoy sharing this spirit both with their team at The Spoon Trade and with their customers. Today, this philosophy infuses The Spoon Trade and it shows in their shared passion for feeding the community, sharing stories, and supporting the local industry. The Spoon Trade was voted Best South Coast Restaurant for 2018 in the highly competitive New Times SLO annual competition. 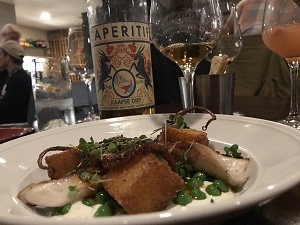 For fortunate diners who decide to just try it on and come in to The Spoon Trade, they discover a restaurant with exceptional food, service, and drinks with unexpected twists in the unexpected place of Grover Beach. Embrace the unexpected. You just may love what happens next.